This new ON1 Photo Kit is amazing for creating razor sharp landscape photos in ON1 Photo RAW 2019. It includes over 107 minutes of in-the-field and post-production training that is entirely focused on creating the sharpest landscapes possible out of camera and in ON1 Photo RAW 2019. 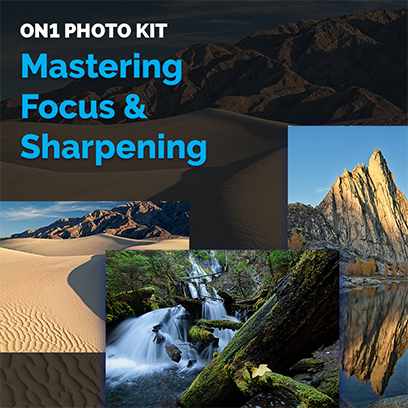 This photo kit will give you a complete understanding of masking, focus blending for images that won’t auto-stack, and blending in layers nondestructively by hand! Learn raw processing and sharpening in the develop tab, and complete stylizing and finish editing of focus stacked and blended files in ON1 Photo RAW 2019! Video Course: Learn focus blending for images that won’t auto-stack, blend in layers nondestructively by hand, learn raw processing and sharpening in the develop tab, and complete stylizing and finish editing of focus stacked and blended files in ON1 Photo RAW 2019. PDF Cheat Sheet: follow-along with Hudson the entire way in this course outline, cheat-sheet. Raw practice files: Use the exact same images he does for the video course to dial in the techniques and workflow for creating razor sharp landscape photos. 40 ON1 Presets: Hudson Henry’s Four Seasons ON1 Preset Pack- inspired by the seasonal looks of Hudson’s favorite locations: Death Valley Summer, Northwest Fall, Palouse Spring, and Patagonia Winter. 10 LUTs for ON1 Photo RAW 2019: 10 of Hudson Henry’s Moab LUTs- LUTs to apply specialized looks to your photos before you get creative with filters. Inspired by the various locations they are named after. BONUS Video: Presets + LUTs in ON1 Photo RAW 2019 –A deep dive with Hudson Henry into Presets and LUTs inside of ON1 Photo RAW 2019. 20 High-resolution Western Skies:30+ mega pixel photos of beautiful cloudscapes from across the western United States.